Trouble Getting Approved in Virginia? Legal Maximum Interest Rates: Quote: "8% unless contract specifies (§6.1-330.53)"
Usury Penalties: Quote: "Borrower may recover twice interest paid, court costs, and unreasonable attorney's fees (§6.1-330.57)"
Judgment Interest Rates: Quote: "9% or at contract rate, whichever is higher (§6.1-330.54)"
Legal Exceptions: Quote: "Revolving credit accounts (§6.1-330.64); private college/university (§6.1-330.66); state or national banks; savings and loans; credit unions (§6.1-330.48); secured by mortgage or deed of trust (§6.1-330.71); installment credit plan (6.1-330.77)"
Most people when they apply for a loan or even a bad credit loan have an amount in mind that they want to borrow. This applicant knows how much he can afford to pay each month and wants the highest loan he can obtain while staying within this limit. Richard wants a loan with a three year term and a loan payment that is no more than $250 a month. He also has a bad credit score which makes it more difficult to obtain a loan in the first place regardless of how much he wants to borrow. Knowing what you can afford to pay is actually a good thing. It prevents clients from taking on a loan that is too much for them to handle and avoids further payment issues. Richard needs the money to help him consolidate his credit card debt and to also pay for repairs to his car. Since he did not indicate how much he needed, we are not sure whether the loan will be enough to cover these debts. With bad credit scores the best interest rate he might be given is 9.74%. With a three year term, a loan of $7800 could be considered. The details are shown below. As it turns out, Richard only needs a loan of $4800 to cover his debts and pay for his repairs needed for his car. His monthly payment will be lower and more easily affordable for him. Richard ended up with bad credit due to a number of mistakes he has made in the past couple of years. He missed some monthly payments on credit cards and rent when he decided to go on a road trip and not make arrangements to pay his monthly debts. When he got back, he found collection letters in his mail and the companies had made reports to the credit review agencies. These reports have remained on his credit report for the last 4 years. It can take as long as seven years before various reports are removed from your credit score. In Richard's case it affects his borrowing costs and even his ability to borrow money for many years. An expensive mistake to make. He learned his lesson and wants to make sure that he does not fall into that trap again. All of his other indicators are good. He has a good job, he is managing his debt and with this loan will stay under the 35% measure for monthly payments vs. income ratio. He has arranged for his pay check to be deposited to his checking account and the same with any loan payments he must make. If he is approved for this loan it also will be automatically deducted from his checking account. He must make sure that he has sufficient funds in his account to pay whatever payment is due at the time. If you live in the State of Virginia and you're struggling to get a loan approval with a bad credit rating we hope our website helps you in some way. Last 5 debt service loans approved in the State of Virginia. Source: WFL Lender Pool. Updated Weekly. Principals rounded to the nearest $1000. Relative interest rates listed below in order left to right. 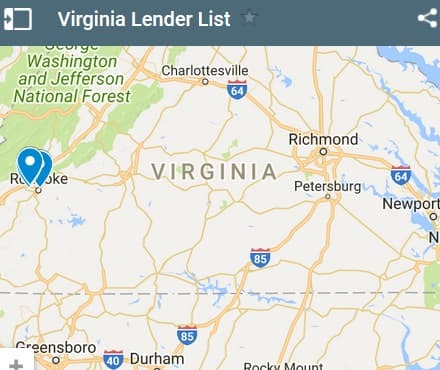 Virginia borrowers can utilize the lender lists above if they want a loan to get them over a hump in their financial life, and they can specifically check out the companies above for debt services such as debt relief, consolidation and/or settlement. However, if you have a low credit score, these traditional lenders (credit unions and banks) won't likely approve your loan unless they have some kind of rock solid collateral on the note. If this is the situation you're currently dealing with, then you can use the bad credit form above for an unsecured debt consolidation loan. 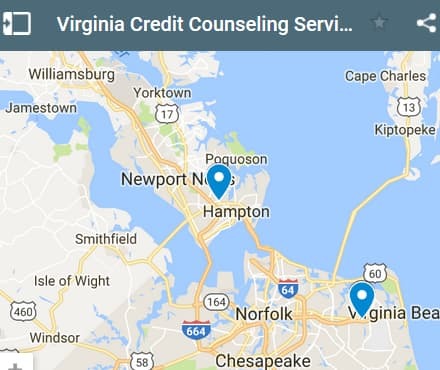 From Virginia Beach out west to Roanoke if you have bad credit, we'll do our very best to connect you with a willing lender that does business with bad credit borrowers. Esperanza from Newport News has had trouble holding on to a job over the past year. She is on her third job and she hopes this one is going to work out for her. When she lost her job the first time she used her credit card to pay some bills. After she lost her second job, she did the same thing and now she owes close to $10000 in total credit card balances. She really needs to keep her current job and she needs to find a loan for $10000 with a five year repayment plan that allows her to keep her monthly payments at a reasonable level. The first job she lost was due to the company downsizing and later declaring bankruptcy. It took her by surprise and she had to scramble to find another job. She received a small payout only because they laid her off before they declared bankruptcy, otherwise she would have received nothing at all. It also took her five weeks before she was able to find another full time position at another small company near where she lives. She seems to have bad luck choosing companies. This one kept her on only for four weeks before laying her off. They were just not developing sufficient sales to keep all of their employees working. They said they would hire her back if and when they had more work for her. Her current position seems a little more secure. The company is growing and they are continuing to hire more people. She hopes the third one will be the charm. Esperanza normally would not be a bad credit risk. The problem is that she has been at three different companies in the past year. Lenders look for stability in a number of areas including employment, bill payment etc. While she has a good credit score her employment record makes it difficult for lenders to approve this loan request. If she does not receive this loan, she will have to pay the high interest rates that credit card companies charge on overdue balances. In her situation, the rate charged will be in excess of 21%. She will pay the minimum balance each month until she can catch up on her rent and utilities. As soon as she can, she is going to pay larger amounts towards the credit card balance. Esperanza is also willing to ask her employer to prepare a letter showing her current employment status and income level. She is hoping that this letter will help her obtain the loan and increase the chances of being approved. She is also willing to have the loan payment taken directly from her paycheck to ensure that the loan is always paid on time. Most lenders prefer loan payments to be deducted from the same checking account that their pay check is deposited into. More to come on this loan request. 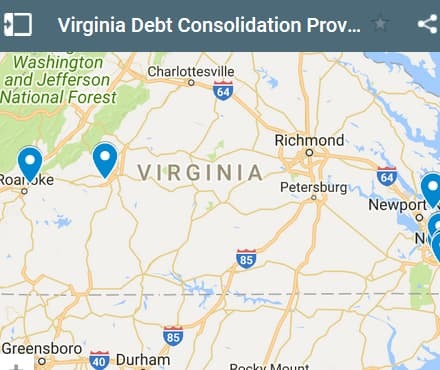 If you live in the State of Virginia and you're trying to get approved for a debt consolidation loan, we hope our website helps you find a good lender regardless of your credit rating.